Three female led stories from the chilly plains of Montana. It's rare to find an anthology movie outside of the horror genre. It's even rarer to find one that's worthwhile. And it's rarer still for one to be led, as is Kelly Reichardt's Certain Women, by female protagonists. Adapting Maile Meloy's 2015 short story collection, Both Ways Is the Only Way I Want It: Stories, Reichardt presents us with three tales of women set against the windy backdrop of rural Montana. The first story focusses on Laura (Laura Dern), a small town lawyer constantly pestered by Fuller (Jared Harris), a client who won't take no for an answer despite how many times she tells him his case against his former employer is unwinnable. It's only when he hears the same thing from a male lawyer that Fuller finally accepts his fate, which prompts him to take a security guard hostage in his employer's offices and call for Laura to investigate the company's files to assess whether he was screwed over or not. We then meet Gina (Michelle Williams), who along with her husband Ryan (James Le Gros), who just happens to be having an affair with Laura, is in the process of attempting to build a house from scratch. With the aim of getting their hands on the pile of sandstone that rests on his land, the two visit Albert (Rene Auberjonois - what a joy to see him back on screen! ), an aging man whose senility makes them feel uncomfortable about their demands, leading Ryan to undermine his wife and jeopardise the deal. Finally, we're introduced to lonely ranch hand Jamie (Lily Gladstone). Wandering into a school after hours, she comes across an evening class taught by young lawyer Beth (Kristen Stewart). After class the two strike up a conversation and retire to a local diner, where Jamie looks on in quiet admiration as Beth eats and talks about her own life, barely acknowledging her new companion. As this routine continues for a few weeks, Jamie falls further under Beth's spell, but with no sign of her affection being reciprocated. If you're expecting tight narratives that wrap up neatly, Certain Women may prove a frustrating watch. The stories here are from the Raymond Carver school, more interested in characters and their interactions than in weaving a comfortable three-act story. Those interactions are decidedly awkward, with the three protagonists all finding what should be simple, practical transactions - a client's acceptance of a verdict, the acquirement of a pile of rocks, a lift to a diner - leading to various states of emotional discomfort brought on by others' need for human interaction. All three stories feature characters who deal with their loneliness in their own ways, from Fuller's begging for a letter from the lawyer he's only ever known professionally, to the aging Albert's lies about having company when he's really left alone on the Montana plains, to Jamie's heartbreakingly misguided romantic gestures aimed at the disinterested Beth. As is her way, Reichardt tells these stories with the utmost restraint. 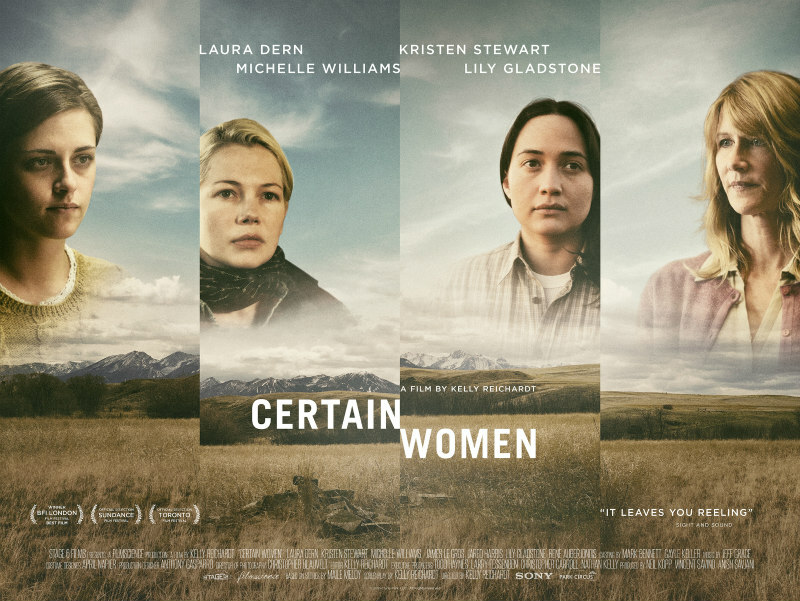 Filmed largely in wide shots, Certain Women creates a discomforting feeling of voyeurism, like stumbling ill-equipped into someone else's emotional breakdown. Whether you empathise with the loneliness and vulnerability of Fuller, Albert or Jamie, or the guilt of Laura, Gina or Beth, you'll likely find something here that strikes a chord, if perhaps an unwanted or unacknowledged one. Certain Women is in UK/ROI cinemas March 3rd.